It is the Fourth of July. It is a meaningful day for citizens of the United States and has come to signify not only the independence of our country but also summer at its fullest. Today all over the U.S. families are gathered, charcoal grills are fired up and the smell of hamburgers and hot dogs permeate the air in towns around the U.S.. Most communities have their own firework displays to cap the celebration of the day. Once again friends and families gather to share the spectacular light display. With all the joy people laughing and celebrating, I am crabby. It may be more precise to say I am nervous and worried and that makes me crabby. Weeks before the holiday my stress level begins to ramp up for what will be my work post holiday. These days, that holiday begins in late June and extends most of, if not all of July. Don’t get me wrong. It isn’t the holiday itself that puts me off. I am proud of our country. I love grilled hamburgers and no one loves family gatherings more than me. The holiday part of the Fourth of July is great. Sometimes however I think the meaning gets lost in the craziness of celebrating. Too many people put aside sanity and responsibility during some activities on this holiday. Fireworks, bottle rockets and other explosive creations produce eardrum splitting bangs, literally shake the earth with reverberation. Fireworks displays explode in the night sky creating temporary daylight. The past few years’ news media acknowledges that pets, dogs and cats may be frightened by the sights and sounds of fireworks. We are encouraged to keep our pets indoors or better yet in the basement if you have one to prevent the effects from upsetting the animals. Some animals may require sedation from the veterinarian to get them through the noisy celebration. I am happy we humans seem to have caught on that animals are not as thrilled with fireworks as we apparently are. But, how long will it be before we remember wildlife are animals too? Wild animals are even more sensitive to the intrusions in their home. They are actually “out there” when a bottle rocket screams through their tree home. There is no soothing voice of an “owner” to calm shaky nerves. Complicating this, the time frame, early July is exactly when many species have babies. Can you imagine any situation more frightening to any parent no matter if they are human or other animal species than your young being in the middle of a firefight? I have heard folks say fireworks are just like lightning and thunder which are totally natural and part of the natural world? REALLY? Give that a moment’s thought before it becomes a defense for human stupidity. I see a different aspect of the holiday. I see Bald Eagles that have had their nests destroyed with creative combinations of explosives that pass as 4th of July celebratory activity. Bald Eagles in my part of the world are nearly ready to fledge their chicks on July 4th. Eaglets often panic and jump from the nests located high in the tree tops. They fall helplessly into the night hitting limbs and other trees in the process. If they survive the fall, they are often badly injured. This year I have already received a call that an adult bald eagle is on the ground with what appears to be at least a broken leg suffered July 3rd when some knot head shot bottle rockets into the nest tree. Oh did I mention they knew the nest was there? “Kind of wanted to see what the eagle would do”. We are still looking for the eagle as he disappeared into the wilderness when the same people chased him once he was on the ground. He may well starve to death in the same woods in which he lived unable to hunt for himself or protect himself from predators. And..what of his youngsters? Every part of me wants to scream at these callers, but my job is to take care of the wildlife not evaluate the mental state or IQ of the caller. Families throughout the country seem unsatisfied with the beautiful fireworks displays their community provides, but also get their own. They have some to expect some pretty spectacular shows in their own backyard. Even worse some take their “personal stash” of fireworks to “the lake” or camping in forests where wildlife abounds. Most people have no idea how many native birds and other wild creatures are either killed,injured or flee from their home into the unfamiliar night only to starve during this holiday. It isn’t just birds. Consider than deer fawns are only a month of so old at this point. I could go on and on. This is breeding season in most parts of our county. We creative humans seen unaware of the consequences of our actions. I will be busy during the next week. We will have lots of orphaned or lost babies to rear here at REGI and those will be the lucky ones that are found. No doubt the finders will be stunned that their bottle rockets set off in celebration actually set that young hawk on fire or made the robin babies flee their nest. They always are surprised it seems. Cause and effect is a pretty simple concept but all bets are off when people rationalize they are celebrating. I don’t get it. My wish is that people could enjoy the fireworks that are done professionally by their community and embrace their beauty and controlled presence. Please think about wildlife when you buy your own. If you need to set off some loud and obnoxious items do it in the street not in your backyard or through a tree. If you want to know what happens when you shoot a bottle rocket into an eagles nest, just call me and I can tell you. Another great topic that everyone needs to be educated on. 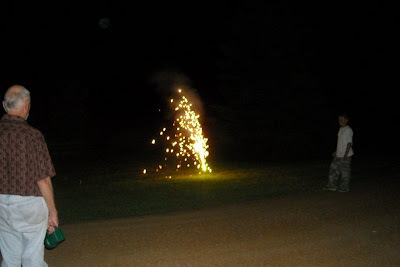 We had more fireworks than ever being set off by landowners all over our township this year. The knowledge you bring to folks is tremendous for our wildlife! !